Name: can be anything you wish. Category: You must type Calls as that is how we identify our call events we send to GA.
Action: In the example above, this goal was set up to track calls from the source “Google Adwords” in the “action” section. You could leave this action field blank to include all calls or you could set up a goal for each one of the sources you are tracking by putting each source (make sure you name it here the same way you have named it in our system- in your case, the source is named “Google Paid”) in the action field. Value: The value field is a way for you to only count calls over a certain amount of seconds as a goal. In the attached example, we are only tracking calls over 60 seconds as a goal. You can set the goal value to be anything you want. 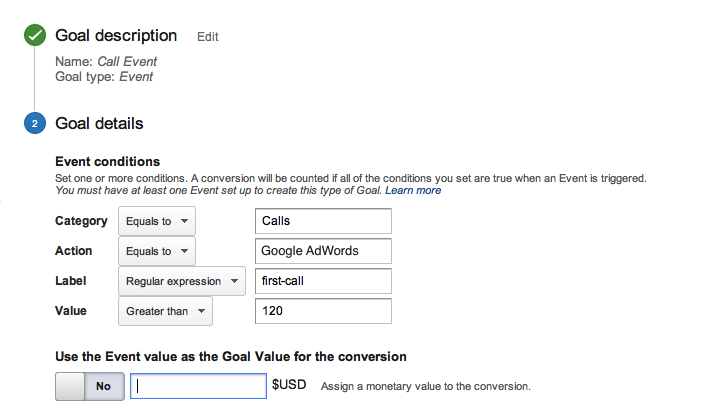 Use the event value as the goal value for the conversion: Turn this on only if you want a value to be imported into Google for the goal completion. If you turn it on and leave the monetary field blank, then the value will be equal to the length of the call in seconds. If you put a value in the monetary field, then that will be the value of each call. Once you have your goals set up in Analytics, you can go into Adwords and choose to have those goal completions imported automatically as conversions.